Fernando Reviews ‘White House Down’ and Loves It!!! God bless you, Roland Emmerich. It looks like you finally read my last review where I asked you to please stop caring about any sort of plot in movies and just focus on action. 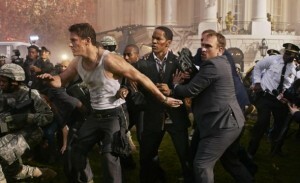 Emmerich brings us “White House Down,” a movie about a world where Jamie Foxx plays Barack Obama…I mean, “President Sawyer,” who signs legislation to bring peace to the middle east, and then is targeted by white supremacist domestic terrorists in an effort to start a nuclear world war 3……does this sound crazy? HELL YEAH IT DOES!!! The whole movie is ridiculous and doesn’t ask the viewer to suspend reality, but throw that whole pesky thing called reality out the damn window, while shooting rocket launchers out that same window, and doing triple backflips while shooting two guns and kicking some dude in the face all at the same time. I think saying that this is Emmerich’s masterpiece of explosions is an understatement. 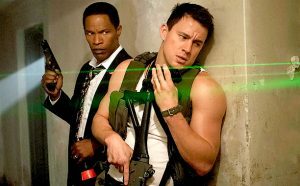 Oh, and Channing Tatum is in this too. He plays the President’s de facto security guard, even though he got turned down from a secret service job, which makes this the perfect recipe for a buddy cop film, except that the cops are the President and Rambo if Rambo was very dreamy. Fernando Knows What Film Will Win ‘Best Picture’ At the Oscars This Year!!! This entry was posted on Thursday, June 27th, 2013 at 10:22 pm	and is filed under Film, News. You can follow any responses to this entry through the RSS 2.0 feed. You can skip to the end and leave a response. Pinging is currently not allowed. Can I hate a film I expect to be dumb for actually being dumb? I got some entertainment out of it. Good review Fernando. « Film Review: ‘The Heat’!!! [Shoots his gun] Now you did.